Urs Fair is celebrated in the memory of a Sufi saint Khwaja Moinuddin Chisti. 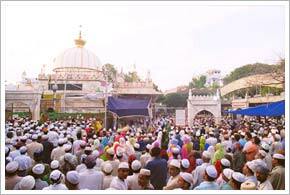 It is held at Dargah Sharif at Ajmer where the Sufi saint was buried after his death. The literal meaning of Urs is wedding. The South Asian Sufi saints mainly Chishtiyya are called lovers and God as beloved. Their death is called Wisaal (union with the beloved) and their death anniversary as Urs (marriage). Sufi saint Khwaja Moinuddin Chisti had contributed a lot to humanity by helping the poor and the needy. His deeds earned him the title of Gareeb Nawaz (one who helps the poor). The Urs fair is the largest and the most celebrated Islamic fair in India. Muslims celebrate it with great passion and joy. Thousands of devotees flock to Dargah Sharif to offer prayers. The uniqueness of this fair is that people from different religious background participate in this fair. It is believed that if you place your faith in the Dargah Sharif and pray earnestly your prayer will surely be answered. The only requirement is child-like faith. It is said that the Mughal Emperor Akbar came to Dargah Sharif in the 16th century to offer prayer for an heir and his prayer was answered. The offerings made at the Dargah Sharif by the devotees include Chadar, Ghilap and neem. The inception of the Urs fair is marked with hosting a white flag on the Dargah. Sajjada Nashin, the successor representative, of Chishtis is entrusted with this responsibility. In the Dargah complex, professional qawwals make the ambiance joyful by singing in the praise of the saint. Inside the sanctum sanctorum, the tomb is washed with rose water and sandalwood paste. Then it is anointed with perfume. This is followed by covering the tomb with an embroidered cloth. Kheer is distributed as the blessed food amongst the visitors. On the last day of the fair visitors enjoy Mushaira and the fair come to an end with burning of crackers.